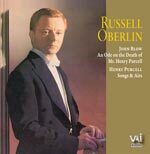 Rare early recordings (1953-54 Esoteric Records) by the celebrated countertenor Russell Oberlin of Blow’s “An Ode on the Death of Mr. Henry Purcell” and various Purcell Odes and Songs. Mrr. Oberlin is joined by an elite ensemble including Charles Bressler, Bernard Krainis, Seymour Barab, Paul Maynard and others.